Tree pruning is a critical part of property maintenance. Not only can it do wonders for enhancing the visual appeal of the landscape, it also plays a key role in keeping your plants happy and healthy. Here at Williams Tree Pro, we go to great lengths to provide a leading tree pruning service in Perth that’s carefully designed to help make your landscape flourish. 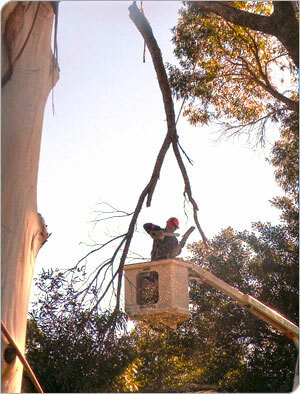 Combining state of the art equipment and expert techniques refined over years of experience in the industry, Williams Tree Pro is your number one choice when it comes to tree pruning in Perth. Give us a call now on 0416 356 359 to get your free quote or read on to learn more about our services. As the name implies, this type of pruning involves selectively removing dead or diseased branches. This reduces the risk of dead branches causing damage or injury when they fall to the ground, and also prevents the disease from spreading to other limbs. This type of pruning is all about removing small and/or weak branches from the canopy of your tree in order to thin out the crown. This allows more light to filter through the canopy and reduces the burden on the main structure of the tree. By pruning limbs and branches from the lower part of the tree, you’re able to effectively raise the canopy. This can be a very effective option if you find that low hanging branches are interfering with the surrounding environment. This method effectively reduces the overall mass of your tree. By reducing higher branches back to lower branches so youare able to manage the height and size of your tree without removing an entire limb or tree. For best results a maximum of 1/3 of the canopy only, can be reduced at a time. When it comes to selecting a tree pruning service in Perth, you need to be confident that the company has the experience and expertise required to carry out the project to the highest level of quality possible. That’s where we come in. With more than thirteen years of experience in tree removal and tree management, our team of qualified aborists know exactly what it takes to make your landscape shine. We strive for professionalism in all aspects of your business, so you can rest assured that we’re fully licensed to perform high risk tree work (Registration No: WL821106 Worksafe), and all our equipment registration and certifications are complete and up to date. In addition, we are a member of the Tree Guild of Western Australia and we are also insured with $10 million in public liability cover to provide you with the ultimate peace of mind. How Will You Benefit From Investing in Tree Pruning in Perth? There are three key benefits of investing in tree pruning services. Firstly, keeping your trees neatly pruned is critical for maintaining a beautiful landscape. Removing wayward branches and trimming messy canopies can help you unlock a better sense of symmetry and introduce more light into your outdoor spaces. Secondly, regular tree pruning can have a significant impact on the safety of your property. As trees age, they may become brittle or riddled with diseased branches, both of which can increase the chances of a branch snapping off and damaging whatever lies beneath it. Pruning your trees minimises this risk and helps keep people and property safe. Finally, tree pruning can help you manage diseases that may affect the growth of your tree. Removing affected branches allows you to contain the spread of disease and keep your trees healthy for years to come. No matter the size or scope of the job, Williams Tree Pro is here to help. For a complimentary free quote, or to find out about any of our tree removal services, give us a call today on 0416 356 359, or fill out our online enquiry form and a member of the team will be in touch with you shortly.